The official Digimon Adventure Twitter posted a teaser this morning, just a few hours before it hits midnight and it's the official release date of Digimon Adventure tri. Part 6. 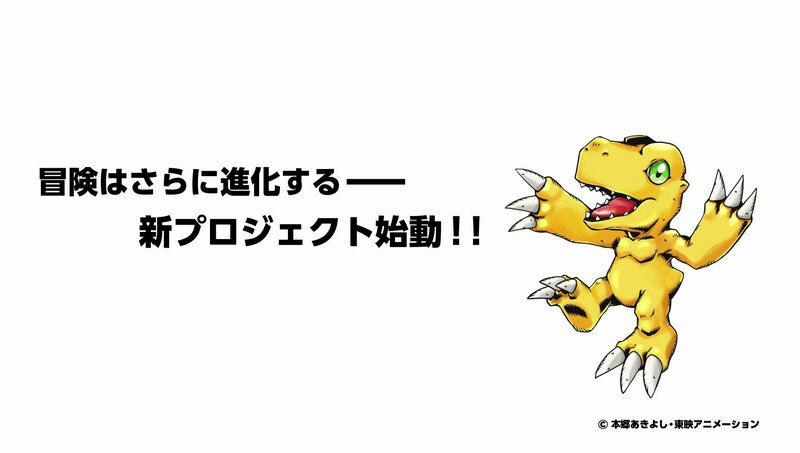 It's a drawing of Agumon by Kenji Watanabe with a short bit of text. Apparently it was at the end of tri. Part 6 at the early screening with Director Motonaga and Kenji Watanabe, and will show up at all screenings. Thanks to shin for the translation. Update- Toei Supervisor Seki Hiromi mentioned on Twitter in response to the teaser that she will try hard. Hiromi is one of the people who helped make Digimon an anime, as a producer, and it's great to see that connection continue. Thanks to Shadow Shinji for the heads up about the tweet and onkei for confirming some details. Well, how about that. They're actually going to take advantage of Tri's success and give us more to look forward to. Just like that I've gone from being sad at Tri ending to being excited for whatever this is. I hope this is a show/movie/ova or whatever, I want to be able to look forward to more Digimon to watch! I would be all over a 02 continuation, but I’ll be excited for anything! Another Adventure show would be amazing! To me it sounds like it is as they say the adventure evolves once again on Tri. synopsis of each movie so saying evolve again must mean a Tri. related project in my opinion. I hope for a prequel to Adventure featuring the Original Children or Appmon Zero Two, but knowing life for a longer while I can bet they meant another game for a system I don't have and will never have, or another Digivice. If is an Adventure continuation, I wonder what it’ll be called? We’ve had Adventure, 02, and tri. Hopefully it’s something like Quad or Square. I am hoping that it comes with a few x-antibody Digimon. I can see the three carrier in training Digimon in it at some point in time. The thing is "play with nostalgia" is more profitable with Adventure. I'm not saying this will necessarily be an Adventure project. I just don't think a Tamer project would be the first election of Toei/Bandai. If it's Adventure specific, it would be amazing if it was an adaptation of V-Tamer 01! But I would also be okay with an 02 sequel, too.